What are we supposed to do about those things that the Bible does not specifically address? How should we dress? What should we eat? What types of activities are appropriate entertainment for Christians? I think Romans 14 gives us some tremendous principles for making decisions such as these in our lives. 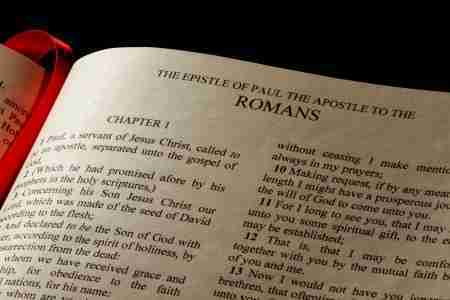 I look at the book of Romans in two main divisions. The first is Salvation and is made up of Romans chapters 1 through 11. The second part of the book is Service. This section goes from Romans 12 to the end of the book (chapter 16). Chapter 14 is a chapter about how to make decisions for ourselves and how to deal with other Christians. Not all Christians are at the same stage of maturity. God deals with each person differently at different times. In some areas I may be the stronger brother while in other ways I am the weaker Christian. The main thing is to be obedient to the Word of God and sensitive to the Holy Spirit’s leading in my life. There are obviously many things that the Bible draws a very distinct line of right and wrong. However, there are practical day-to-day activities and behaviors that the Bible does not address directly. We need principles from God’s Word to guide us in those areas. I believe Romans 14 is one of those guiding chapters that can help us make wise decisions. Paul (the writer of Romans) uses food as an example in these verses. But the application is to many more things than just food. In his example he says that some Christians are stronger and some weaker than others. Here he is referring to their spiritual maturity and not their physical condition. In this maturity some have come to the place where they realize that the food going into the body is not what makes something clean or unclean. However, it is the attitude that a person has in eating (or any other activity) that can defile his body (Matthew 15:10-20). We are given the freedom to chose in those areas that the Bible does not directly address. Paul tells us not to judge one another, but to make the decision to eat and drink based on how the Holy Spirit is guiding us (vv. 2, 3). We have no right to judge God’s people. They have the same liberty that we have. They belong to God; therefore, allow God to be responsible for His own people (v. 4). Paul gives us another example in honoring special days. Whether someone celebrates a holiday in the same way as you do is not as important as honoring God in your celebration. God should be the focus and not the food or special day. Being completely convinced that you are honoring God in your actions is the key. Maturity comes when you have given serious thought to participate in or abstain from certain activities (vv. 5, 6). We are bought with a price. We are not our own. We have a God and Savior who love us and have laid claim on our lives (1 Corinthians 6:20; 7:23). Paul says we no longer live for ourselves (vv. 7, 8). Christ died so that He could be the one to lead us. I don’t need to step into someone’s life and pretend that I am their authority (v. 9). Each one of us will stand before God to be judged by Him (vv. 10-12). I need God and His Word giving direction in my life. I certainly need other people to stand near me and show me what God has to say about certain things. We know God uses others to point us in the right direction (Proverbs 11:14; 15:22). God wants us to assemble together and learn from one another (Hebrews 10:25). However, where God is silent on a subject, either in direct command or in principle, I should allow Him to guide me. And, I should step back and allow God to guide those around me. I don’t need to make their decisions for them. Instead of judging others we are instructed to judge our own action towards others. Paul says to not put anything in our brother’s way that would cause him to stumble and fall (v. 13). Sometimes something that you have determined to be perfectly fine and appropriate is something your brother has determined to be wrong. Whether that is a stronger or weaker brother Paul says that maybe you should abstain from that activity for the other person’s sake (vv. 14, 15). This is the law of love: surrendering your own liberties for the benefit of those around you. There are things in life that are more important than food or entertainment. These things are righteousness, peace, joy and edification of other believers (vv. 16-19). Those are the activities that should captivate our attention. Stay away from doubtful things and focus on building up other believers. The conclusion of the discussion is that we should abstain from those things that are a hindrance to others even if there is no other biblical command to abstain. We should live for the sake of building up others and not just for our own desires and liberties (vv. 20, 21). This also means that we should allow other Christians the liberty to live in the way God has led them. Unfortunately, we probably all know Christians who are controlling and demanding. They don’t want to let you live by faith in God, His Word, or the leadership of the Holy Spirit. These overbearing brothers try to take the place of God in your life. I pray that you are mature enough to know the difference between one who is trying to help you grow in maturity and one who wants to be a bully in the name of God. But also realize that God can use these people to cause you to think about your activities. Remember that a mature Christian is one who has made a conscientious decision about whether they should or should not engage in a certain practice. In the final two verses of the chapter Paul gives us a final principle for making decisions. Have faith in God. Allow Him to lead. You should be completely convinced that your activities honor God. If you are not sure, then stop doing them. Seek God’s direction in that activity. Live a life of faith and not of doubt (vv. 22, 23). What activities have caused friction between you and another Christian? What should you do to resolve the conflict? Are there certain activities that may be right for one person but not for another? Who are mature Christians supposed to judge? Can you think of any activities that you know your fellow church members avoid that you believe are appropriate to participate in? What should you do when you are around your friends who believe an activity is wrong but you think it is permitted? Stand for your liberty as a Christian? Be a hypocrite and pretend you don’t participate in that activity? What is your response in this situation? Based on this study of Romans 14, what changes do you need to make in your wardrobe? Your entertainment? Your choice of food and drink? Your celebration of holidays? I love the book of Romans. I hope this study of Romans 14 has given you a greater appreciation for God’s Word and what He is attempting to teach us in this wonderful book.